For many of us the idea of having a pared-back, simplified capsule wardrobe is hugely appealing. No more frantic rummaging for things to wear in the morning, instead we can pick from a tasteful selection of complementary clothing. But what if you love your minimalist wardrobe but still have a maximalist heart? Interior design trends seem to be moving away from the clean whites and neutral backdrops of recent years, and instead embracing prints and colour. If you want to keep your wardrobe simple but also to inject a splash of vibrancy and warmth, here’s how you can do it with a few easy-to-wear linen pieces. These will bring a natural texture and charm to proceedings, as well as adding a pop of colour to brighten things up, without being shouty or over-the-top. We’ve chosen these additions in the belief that making little changes to your wardrobe can give you a boost. We want clothes we don’t have to think about, clothes that we can just pull on and instantly feel great, clothes that work from school run to office to grocery store and on into the evening. When we find something we love we stick to it. But we also love to play with accessories and introducing new colours when things get a bit tired. A top quality linen scarf is your friend here. Great for transitioning between seasons, when it’s too warm for coats but there’s an autumnal chill in the air, a linen scarf will also add colour to an understated outfit. Go for bold, warm tones that work with your skin and hair colour. If you have cool undertones opt for blues and purples. If you have warm undertones opt for yellows, ochres and oranges. Simply drape around your neck for an instant wardrobe pick-me-up. If you don’t want to go all-out with colour adding an accent is easy with a cheerful linen tote. Practical as well as pretty, linen is machine washable and gets softer with each wash. 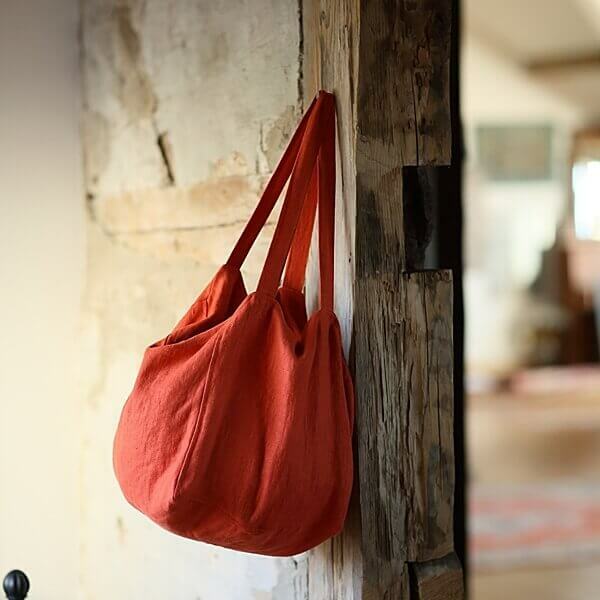 Perfect for a casual, slouchy effortless burst of colour in your day. Pair colours like mustard and pinks, greys and bright blues, and navy and burgundys for stylish ways to wear bold colours. A floaty, simple linen dress is a summer staple. But it also works brilliantly with layers for Fall and Spring. To add a swathe of colour to your autumn wardrobe opt for a linen dress in a pretty, zingy aqua, then wear with your minimalist chunky grey cardigan, some navy ankle socks and a pair of trusty clogs. An unfussy, wear-with-anything linen shirt in a vivid colour looks great tucked into some dark pants, your favourite pair of jeans or a pencil skirt for work. We love this kiwi green shirt paired with navy high-waisted wide-leg pants and dark heels for a smart but interesting twist on minimalist dressing. And you can apply this same principal to your home, too. Not ready to ditch the Scandi-inspired pared back interior? Us neither. But we are up for some soft cushions in jewel colours to bring a grey sofa to life, or a throw in a zesty citrus to pep up a tired bedroom. For more on minimalist wardrobes go here. We’d like to also say a big thank you to everyone who has left a comment on last week’s book giveaway post. It has been fascinating and heart-warming to read about your perfectly imperfect things. Thanks for sharing. There’s still time to enter if you’d like to be in with a chance to win a copy of Beth Kempton’s fabulous new book, Wabi Sabi. It’s going to be HUGE! You left the men out. From summer suits to ties, pockets squares ( pouchets, handkerchiefs) and my traditional Buddhist robes Linen is to often overlooked in menswear.